Sandvik's production plants are designed specially for the efficient manufacture of long products in stainless steels and high-alloy materials in round, square and rectangular sections. After melting in a 75 tonne electric arc furnace, steel is tapped into a ladle and transferred to the AOD (argon oxygen decarburization) converter, where the principal metallurgical process is performed. The steel is then transported to the ladle furnace where the inclusions can be modified. Finally, the ladle is lifted up to the casting platform to be cast as ingots or as continuously cast blooms. In continuous casting, the steel passes from the tundish through ceramic tubes to three water-cooled copper moulds where it starts to solidify. For special steels, required in smaller quantities, we melt in a 10 tonne HF (high frequency) furnace. Steel melted in the normal way can be remelted in the VAR (vacuum arc remelting) furnace to produce a steel with a low content of non-metallic inclusions. Several grades of Sandvik stainless steel are available as Sanmac®, stainless steel with excellent machinability for reduced tool wear and increased cutting speeds. Sandvik has recently invested in a modern rolling mill consisting of a blooming mill and an integrated billet mill. In the blooming mill, ingots and the continuously cast (concast) material from the melting plant are pre-rolled for the forging press and the billet mill. Here, all rectangular (strip) and square (wire) billets, as well as some sizes of round bar for extrusion, are produced. 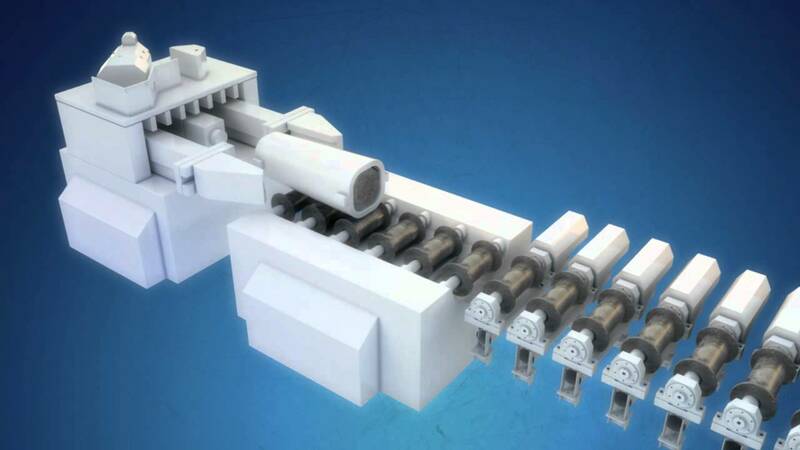 Sandvik has a hydraulic forging press with a maximum press force of around 1800 tonnes.